Photo taken on April 11th, 2003 At The Ontario Skeptics General Meeting. 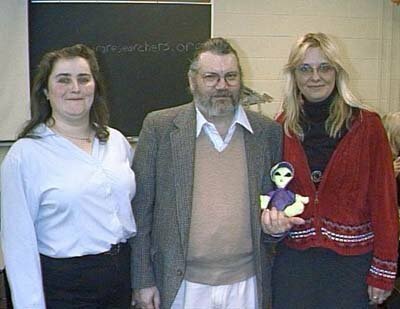 From L-R ParaResearcher's Co-Founder Lisa Reid Finlay, Skeptics Canada Chair David Gower, Mason the Alien Doll, and Co-Founder Sue Demeter St Clair (formerly Darroch). We are a group of Ontario based researchers and investigators who originally formed this non-profit, web-based society in April 1999 in order to share information, ideas, and expertise, which encompass all subjects that fall into the umbrella category of the ‘paranormal’. Our experiences, opinions, ideas, and research are as diverse as the membership of Para- Researchers of Ontario. However, we all maintain common goals - to approach where possible our research in an open and unbiased fashion - to treat those whom have had first-hand experiences in a dignified and respectful manner - to share our findings with the internet community freely and openly, which we have been doing at the time of this writing for 16 years. At that time we started out we were comprised of three young women who set off to view a "ghost light" in Port Perry Ontario one very cold April night. What we saw that evening intrigued us enough to try to figure out what they actually were. And we did it! At least we did in part. We were the first in the province to scientifically prove that some of those ghost lights were car headlights reflecting from the West Quarter Line, that others were potential hoaxes, and a very precious few that appeared to be genuine anomalies. No one used the term "ParaResearcher" back when we started out so it is likely that was something we coined. Over the years we have been fortunate to make new friends, and colleagues, learn new things, explore mysteries, and hopefully trigger interesting thoughts and ideas in others. Thank you for visiting our space on the web.